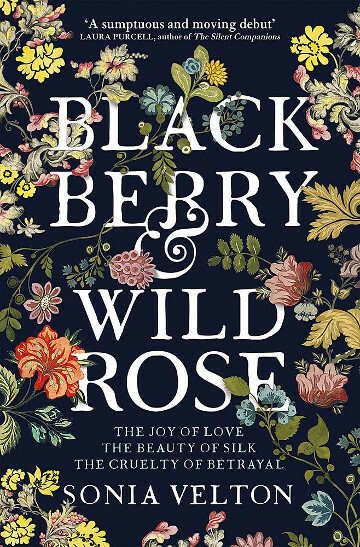 Sonia Velton talks about the pioneering woman whose designs inspired her recently-published novel set among the silk weavers of Spitalfields, Blackberry and Wild Rose. Say “Anna Maria Garthwaite” to most people and you will be met with blank looks. She – like the turbulent times of 18th-century Spitalfields – seems to have been swallowed up by history, becoming a mere footnote to London’s past. 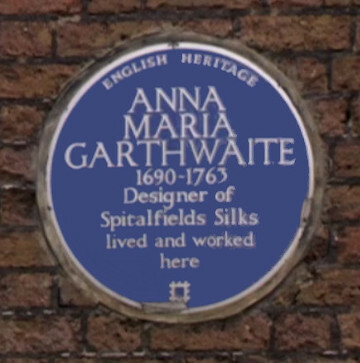 In fact, you could almost miss the unassuming blue plaque on the last house in Princelet Street which says ‘Anna Maria Garthwaite 1690-1763 Designer of Spitalfields Silks lived and worked here’. But to do so would be to overlook the legacy of an exceptional woman. I confess to feeling a certain affinity with Garthwaite. Like me when I aspired to become a writer, she was unmarried and already in her early forties when she decided on a career change. The daughter of a clergyman from Leicestershire, she moved down to London with little more than her artistic talent and a desire to become a silk designer. 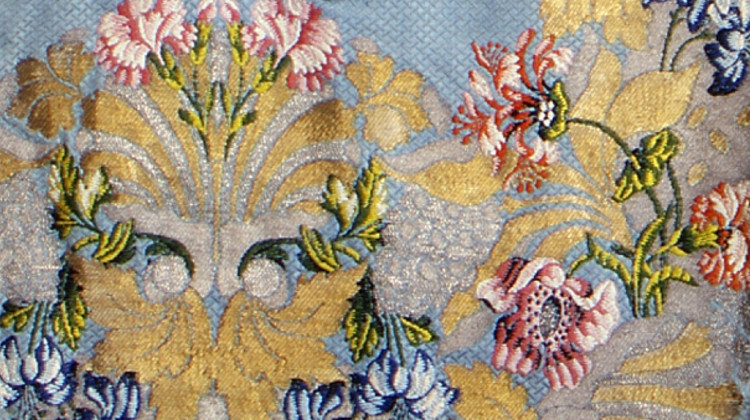 That any woman in the 1700s could go from this to becoming the foremost silk designer in an industry dominated by men is impressive. The fact that she managed it with no formal training in the technical skills required to prepare the mise-en-carte for the drawloom, or any male patron, was remarkable. Whilst most successful silk designers were already master weavers, she broke into the tight-knit industry of the Huguenot silk weavers by sending out her early designs signed only A M Garthwaite. 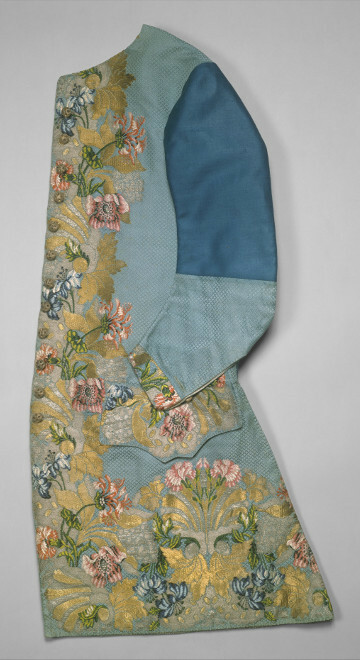 By the time the most influential master weavers realised she was a woman, Spitalfields was already captivated by her naturalistic botanical designs; an almost revolutionary change to the stylised, geometric patterns which had been in fashion for decades. I became a frequent visitor at the Victoria & Albert Museum, which holds the most significant collection of Garthwaite’s work. I pored over her delicate watercolour patterns, retrieved from special rooms by gloved attendants, and stood for what seemed like hours staring at the actual silks, still as delicately luminous as they were almost three hundred years before. I couldn’t help but wonder about the lives of the people who created them. You can still see and feel the presence of the Huguenot silk weavers in Spitalfields. They are there in the wooden spools hanging from the weavers’ houses, they are there in the shadows of the eighteenth century sundial on what was once La Neuve Église, and they echo through the street names; Fleur de Lis and Fournier Street. I remember pausing outside a terrace of Georgian townhouses and looking up to see the ‘long lights’, huge windows built into the attics. Once I discovered that they were silk weaver’s lofts, I kept imagining these tall and gracious buildings alive with the clack-clack-boom of the drawlooms. The whole of Spitalfields would have thrummed with their sound, and everywhere, from the market to the modest weavers’ cottages, would have played a part in an industry which produced some of the most exquisite silks ever made. It was this world of immigrant French silk weavers, their lives and loves, and of course their spellbinding silks, that formed the setting for my novel. Inspiring as Garthwaite is, it is conflict that makes a good novel, and I found that in spades when I started researching the Huguenot silk weavers. The beauty of the Spitalfields’ silks belies the grim reality of life as a journeyman silk weaver. The industry was beset by industrial conflict. At the time, I was a solicitor specialising in discrimination law and acting mainly for individuals and trade union clients. When I discovered that the militant journeyman were among the first pioneers of the trade union movement, forming illegal ‘combinations’ which met in secret, it resonated with the employment lawyer in me. The stock response of the eighteenth century mob was to riot, and the Cutters’ Riots of the 1760s provided the perfect troubled backdrop for my fictional household of master silk weavers. I hope Garthwaite would have been pleased to have inspired my protagonist, Esther Thorel, the wife of a master weaver with artistic ambitions of her own. However, I suspect she might have raised an eyebrow at some of the goings-on in the Thorel household, given that Garthwaite herself appears to have led a very wholesome life, never marrying and living with her sister and their female ward. 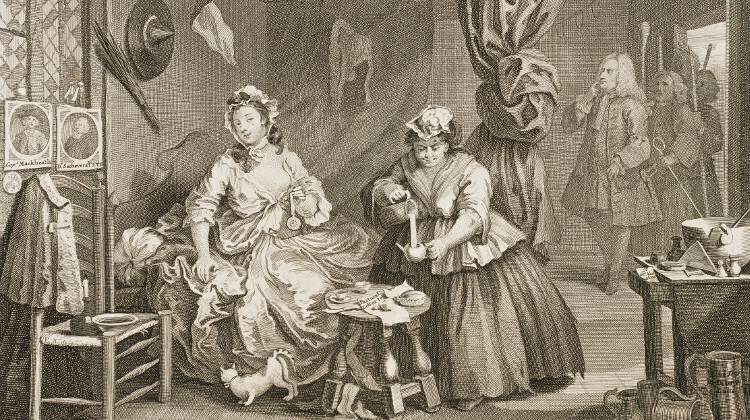 Certainly, Garthwaite would have known little of the world of Sara Kemp, the book’s other narrator, except perhaps what she might have gleaned from William Hogarth’s A Harlot’s Progress. Sara allows us to peer beyond the elegant parlours and ochre-coloured walls of the Thorel household and glimpse the East End’s dark underbelly. This makes Blackberry and Wild Rose a book of contrasts: the ethereal beauty of figured silk, and the finger-numbing hours of repetitive pulling on ‘lashes’ and ‘simples’ endured by the drawboys; the apparent piety of a religious household and the flawed reality of marriage; the strict moral code of the Huguenot community and the chillingly expeditious way 18th-century justice was dispensed; the tasteful privilege of Esther Thorel’s existence, and the life of her new lady’s maid, Sara Kemp, full of chamber pots, brick dust and relentless drudgery. This novel, in its various drafts, had many titles but none was quite right. Looking for inspiration, I turned to my original notes, made on one of my visits to the V&A. I had been drawn to one particular silk pattern. It’s most likely that it was one of Garthwaite’s own as almost all the patterns I looked at were, but it could also have belonged to another designer as I did not write down its artist, just its enchanting name, scrawled messily right across my page: Blackberry and Wild Rose. Anna Maria Garthwaite produced around 1,000 elegant watercolour designs during her long career. To date, I have only written one book. She continues to inspire me. Sonia Velton grew up between the Bahamas and the UK. After graduating from university with a first class law degree, she qualified as a solicitor at an international law firm, later going on to specialise in discrimination law. Sonia relocated to the Middle East in 2006. Eight years and three children later she returned to the UK and now lives in Kent. Blackberry and Wild Rose, inspired by real characters and historical events, was short-listed for the Lucy Cavendish Fiction Prize as a work in progress, was longlisted for the Mslexia novel competition, and is Sonia’s first novel.